Warts are a result of the Human Papilloma Virus (HPV) which has somewhere over 100 types which affect people in different ways, but most often it depends on the immunity. Strains which cause the common warts are harmless to some extent, while other strains are much more serious. Since they are caused by a virus, they have the tendency to disperse to other body parts and to other people. If a certain medical treatments which contained chemicals did not help you, feel free to try these natural, home cures. These cures are indeed helpful, but neither of them can help you overnight. However, they are far more helpful in the curing than to leave a wart to disappear on its own, which usually can last up to several months or even years, if it actually disappears in the first place. 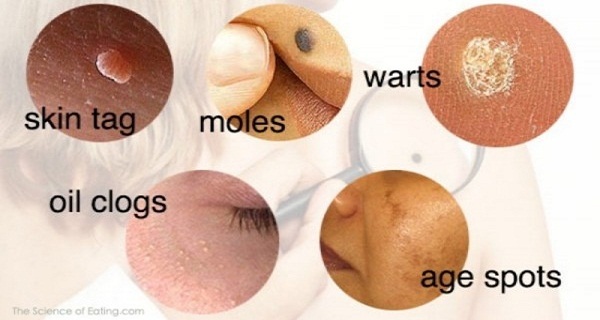 Approximately, a quarter of the warts disappear on their own in a period of six months, but a remaining third is still present around two years after they had first appeared. Moreover, children are most affected by this problem, since their immunity is still weak. This is one of the most helpful cures for warts. It has anti inflammatory properties which help you to get rid of the viruses and bacteria which are the main reason for warts. The area where you apply vinegar should be washed, and then you soak a cotton ball in the apple cider vinegar and gently apply it on the warts. Then, you cover it with a bandage or duct tape and leave it for a period of one day. Do this before going to bed and remove the bandage in the morning. With this treatment, wards will disappear in a matter of several weeks. This is a great herb for warts removal. Mash some garlic and apply on the wart and cover the area with a bandage. Repeat this process twice per day, until the warts are gone. The method with applying the inside of the banana peel for successful removal of warts has been published in several medical journals. A lot of people rubbed the inner surface of the banana peel over the warts, several times per day and got rid of warts. What’s more, if you press the inside of the peel over the wart and tape it before going to bed, you can put an end to the warts. You remove the bandage in the morning and wash off the area. This procedure should be repeated until the wart starts to soften, about a week or so, and the wart should completely disappear for a few weeks to one month. You apply a small piece of duct tape over the entire wart for 6 days, by replacing the tape as needed. After 6 days, the wart should be washed with water and then rubbed off with a pumice stone or an emery board. In the morning, you apply a new duct tape for another 6 days, and continue to do so for two months, or as long as the wart does not go away. Organic Manuka honey, from New Zealand, is the best honey to use for warts removal, but another homemade raw honey should be helpful as well. Manuka Honey is one powerful types of honey when it comes to the concentration of its antibacterial properties. This is a very stable honey, unlike other types and it will not lose its benefits due to temperature changes. What’s more it is a kind of “occlusion therapy” which depraves the wart of oxygen and kills it. Cover the wart with a thick layer of honey and wrap it with a cloth and leave it for 24 hours by changing the bandage and reapplying honey, daily.